Happy December! This month always flies by for me with holiday parties, vacation days, traveling, and spending time with family. Before I know it, I'll be wishing you all a happy 2017! In November, I was signed up for the Pittsburgh 10 Miler, but ended up not running it. I talked about it here, and a bit about burnout here. I've been feeling a lot better since then, and have gotten my love for running back! It doesn't really feel like an obligation anymore, but something that I want to do. I'm starting to plan out my racing schedule for next year, and my big goal is to run a full marathon! I've never really trained for one (but I've finished two..very painfully), but I feel like I'm ready for the commitment and to check that off my bucket list. I have a few other races planned before then, but I'm definitely going to focus on training and not racing a ton next year! This month I went to a Veg Feast. It was a pretty big event and so much fun! We had some amazing food, and since everything was local I have a ton of places to try out now. I talked all about the event here, and I'm excited for the next vegan event in Pittsburgh. I also had my first Thanksgiving as a vegan! We had a low-key dinner this year since most of my family was traveling. I kept it nice and easy by picking up a pre-made vegan feast at Whole Foods on Thanksgiving morning. There was almost a catastrophy- when I picked up the box and opened it up, it turned out that I got the regular box and not vegan! Luckily the workers asked me to make sure everything was included or I wouldn't have even noticed until I was eating. I got the correct box and was on my way, and everything ended up being amazing. This weekend my family is planning on having a Thanksgiving 2.0 dinner while everyone is home, so I'm looking forward to that. This month there weren't that many changes in our house. We tried to get as much done as possible while the weather is nice, so now we're relaxing! In the winter, we have some plans to finish up the living room, and I'll be sharing pictures as soon as it's done. I haven't started decorating for Christmas yet! I usually get out the decorations right away, or at the very latest wait until Thanksgiving. For some reason this year I've been putting it off. I have a lot of vacation days left to use this year so I'm taking off the remaining Fridays, so I'll work on getting that done this week. I also need some opinions- I haven't been updating my home blog recently, and I'm thinking about shutting it down. I liked the idea of starting one to talk about my home projects, but I haven't really kept it updated regularly and I'm always putting off writing posts for it. Would you all be alright with occasional house updates here? 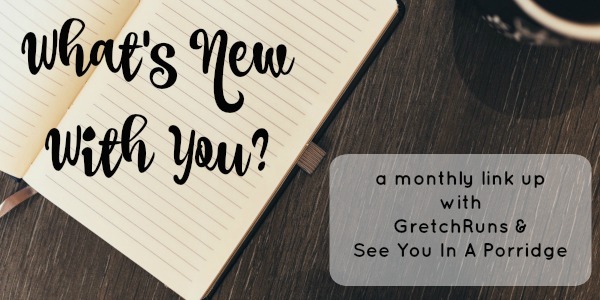 It might just be a monthly post showing what's new, but it would make my life a lot easier! Where They Found Her - I just finished this book, and it only took me about a day to read it all. I'm not typically a fast reader, but this was such a great book. There were three different story lines that all ended up weaving together and a surprise ending. I would highly recommend if you like mystery! It's Not Okay - If you're a Bachelor/Bachelorette fan, you have to pick up this book. It's written by Andi Dorfman, and talks about her experience as a contestant vying for Juan Pablo's heart, then about her turn as a lead, and the ensuing breakup from the "winner" of her season. It was entertaining and an easy read. Perfect for traveling around for the holidays! I'm Thinking of Ending Things - I just started reading this book, but it came highly recommend from a friend and I'm looking forward to diving into it. + Try a new workout class at the gym. I tried PiYo! + Participate in NaBloPoMo. I did it! I posted every single day and I'm pretty proud of myself. - Take a day trip. I ended up having plans every weekend in November, so no day trips for us. Now that I have Fridays off (and Dan gets every other Friday off at work normally), we'll make it happen in December! - Run 85 miles. I want to end the year strong and start training harder, and I'm 85 miles away from 1000 for the year! - 30 Day Yoga Challenge. I somehow got Dan to agree to do this challenge with me! I'm interested to see how flexible and strong I can get after doing yoga for 30 days in a row. - No Buy! I've been going a little crazy with spending lately, so in December I want to do a no-buy. I'd love home updates on here every now and again! I did that 30 days of yoga challenge and ended up really enjoying it! You're so brave to do a no-buy in December! What about Christmas presents?! Loved the recap and congrats on your first Thanksgiving as a vegan. I love that they had the option for that at WF! How easy! So fun to read what's been going on with you lately! Good luck with your marathon goal! I know you can do it and will be very successful. I definitely think you should work your home posts into this blog once a month or so. Keep blogging fun for yourself! Also- thanks for the book recs. Added them to my list! I would definitely love to see you do home updates on here instead of another blog. Easier to read & easier for you it sounds like. If you didn't want to stray from normal posting you could always sneak them in on a random day when you don't usually post. Also so jealous you and Dan have some extra Fridays off together. Perfect for a day trip! Or even just getting errands done without all the people who are out on Saturdays. Um yes, give me all the house updates here:) Haha I love reading about them! And I'm going to have to check out the book "I'm thinking of ending things," it sounds good! I agree with others that I think here would be a better place for your home updates - I certainly wouldn't mind! I have thought about maintaining separate blogs in the past but it just sounded like way too much work. I don't know how you do it! How exciting that a marathon is on tap for this year! Can't wait to hear which one you pick. Since you won't be so busy with life events this year I'm sure you'll be able to train well and have an awesome race! You were doing really well earlier this year! I'm not a runner but last year I happened to be at Disney during the marathon weekend and it looked like everyone was having so much fun. If I was going to take up running I think I would need a Disney run to motivate me! So many exciting things! I have no clue how anyone can do a December no but month but best of luck to you! And the 85 miles! And and four day weeks from here on out!? Phenomenal. Thanks for hosting!! Nick and I did Adriene's 30 Days of Yoga Challenge in March and we loved it! I hope you and Dan do too. Unfortunately we haven't kept up with yoga since buying our house, but I'd love to start again. Hope your other goals go well too! I read (listened) to Andi's book when I was on vacation and it was so eye-opening! It was such a fun read, but I really felt for her. Wow, 1000 miles, That is awesome! I am on track for 600. I am trying to reign in the spending as well. Starting in November I'm trying not to buy any clothes for six months, but then I did all my Christmas shopping instead, so hopefully now that that's done I'll have a quieter month in December. I run two blogs as well and it can be a lot of work. It seems to me like a home post would fit in nicely here and make your life a lot easier. I'm trying to budget super carefully for December and not spend any extra too but it can be hard, especially with all the sales! Good luck! i'm glad you've gotten your love of running back :) i am behind on blog reading but that veg fest sounds awesome. i had no idea you could get pre-made boxes from whole foods, i am very intrigued by that idea lol. i don't run two blogs, but i do talk about anything and everything on my blog, so i say if you want to shut down your house blog, go for it. this is a lifestyle blog right? you live your life in your house, so you can talk about it on your blog. haha. i am intrigued by the 30 Day Yoga Challenge.... I have done a couple of her videos, but never her whole challenge. hmmmm. good luck with your 85 miles! Yeah, that would be cool if you put some posts about your home projects on here! I'd like that a lot. I'm a simple girl. Talk to me like I'm 3. Your Veg Fest sounds really fun! I love the idea of a December no-buy. I went crazy during Cyber Monday, so I feel like I need to be done for the year! Where They Found Her sounds really interesting! What a fun month you've had! Way to go on completing the whole of NaBloPoMo - and being SO close to 1000 miles!! Happy to hear you've re-found your love of running and excited to hear your plans for next year. I read Where They Found Her last summer and ripped through it surprisingly quickly as well! Sorry to hear about the burnout but glad you're getting back on track. I'm happy to hear about your home anywhere you want to write about it! I've heard a lot of good things about PiYo, what did you think? And I'm right there with you on the no buy December! Awe man, I totally missed this. Hopefully I'll catch next month's. I loved It's Not Okay because I am a hopeless bachelor fan haha!